"We’re very excited to share that we’ll be touring this summer with our friends Moe. on the ‘All Roads Runaround Tour’ with special guest G Love," said Blues Traveler in a statement. "Each night will showcase one set from each band plus a very special collaborative set each night." Formed in 1989 at the University of Buffalo, in Buffalo, New York, moe. is an American jam band and a stalwart of the festival circuit, alongside contemporaries Phish and Widespread Panic. With their relentless touring schedule, the band have earned a loyal fanbase, known affectionately as moe.rons, and frequently host their own festivals (moe.lennium, moe.down, snoe.down). They have released 10 live albums to date, as well as 11 studio albums, their most recent being 2014's No Guts, No Glory. 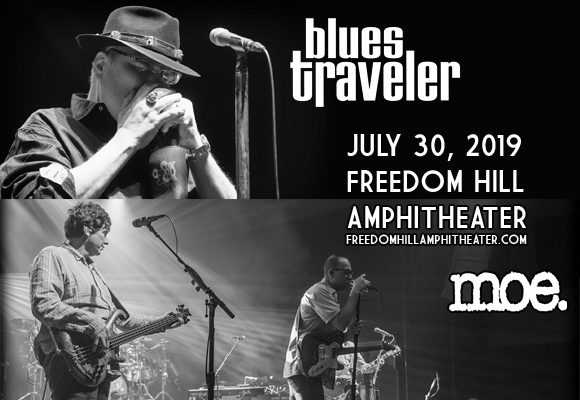 Blues Traveler are also an American jam band, taking a similarly improvised approach to their performance as moe. The band was formed by high school friends in the mid-'80s, and in the 1990s found mainstream success with Top 40 singles like "Run-Around" and "Hook". In 1992, Blues Traveler founded H.O.R.D.E. Festival as an alternative to Lollapalooza, alongside several other popular bands of the time, including Phish and Spin Doctors.